I’m posting this to explain my latest assignment in which I had to create a nameplate for myself. I chose to use the website flavors.me to create my own about me page. I included a photo of myself, inserted a picture to use as a background, provided links to my social media pages, and wrote a brief about me paragraph. I found that I had a slightly hard time trying to identify and describe myself as a professional. I know what qualities I possessed but I had a hard time trying to correlate them into a professional bio. On the other hand, in a weird way I really enjoyed messing around with different backgrounds. I like that I could choose a background I liked and that I thought suited me. I did have to mess around with it quite a bit though so that it wouldn’t be too difficult to read my bio on top. This assignment was for me to search for companies who were looking to fill jobs that involved technology. 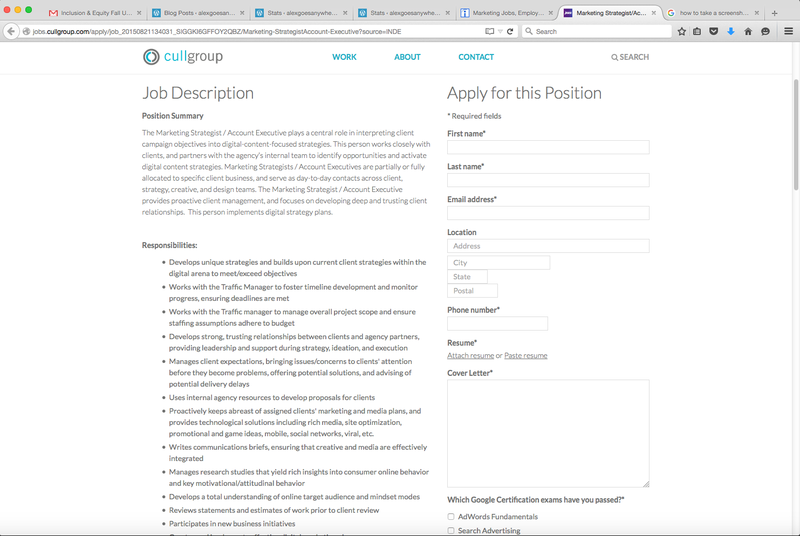 I used the website indeed.com and searched for jobs within the marketing realm that required some use of technology and software. I had to find jobs that I could actually see myself taking on in the future, whether it be straight out of college or 5-10 years down the road. The jobs that I found ranged from managing social media aspects of one company, to being a senior product marketing specialist in another. The five jobs that I chose though all required the use of some form of technology whether it was working with social media, using an ERP software system, or using a computer and various computer programs to track product trends, or create search engine optimization. It is important to learn the technologies within these jobs because they allow for an easier way to reach target markets. Social media is super important these days in staying connected with other people and other organizations or companies. Being knowledgeable in the use of social media will allow for companies to expand to broader markets and reach more people. One of the jobs that I found had required knowledge and use of Search Engine Optimization. This is super important because companies need to be easily searched on the internet, with the growing use of technology, most people find products their interested in on the internet. Another job I found was looking for a media specialist, in which they would create media campaigns and promote their products through media. In this it is important to know technologies within the social media realm, but also in forms such as TV. It would be useful then to know how to use programs such as final cut pro to make TV campaigns. The purpose of this post is to show the skills I have learned in using final cut pro in which I have used to create my own short film. Some of the skill sets I learned within this program include importing content, altering content by adding and removing sound, blending different video clips with the use of transitions, entering text to the video, and exporting the video in the correct format. This video was originally made to be about the life of my dog Zoey. With uploading the video content to my laptop came problems. Because of these problems, my video turned into footage about my dog begging for and ultimately receiving a treat. That then led to the name of my video: Beggars can’t be choosers. 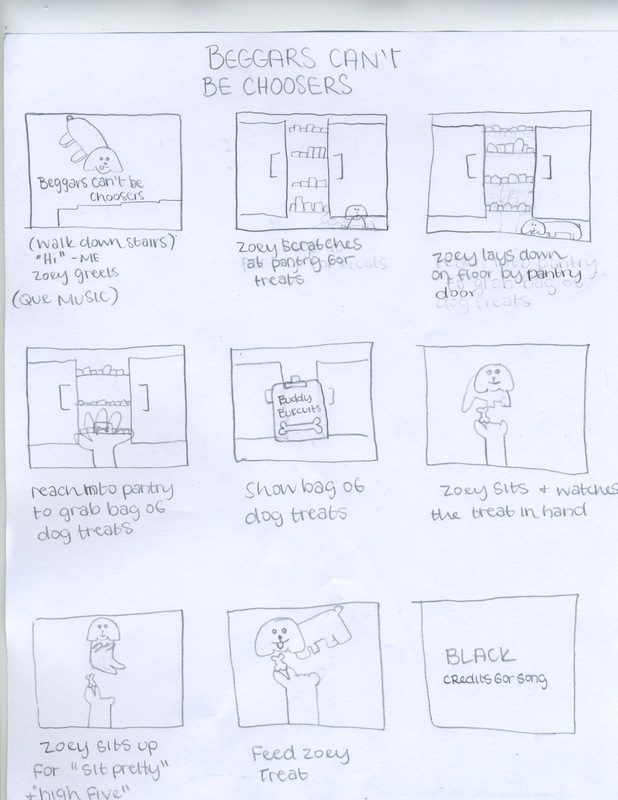 To keep the direction of my short video I created a story board to stick by and make my video accordingly. Besides the fact that I lost most of the footage I shot, I think the most challenging part of this assignment was rearranging the footage I shot to create a decently flowing video. Cutting clips and repositioning I admittedly thought was fun even though I ran into a few instances where things didn’t go my way and I had to spend many minutes fixing and rearranging one measly video clip. I was fortunate enough however to complete the assignment fairly easily and quickly. I actually enjoyed using Final Cut Pro.